Whether your shoulder injury is a result of high-impact trauma or low-level repetition in the gym, the InternalBrace has a solution for you. The collar bone is often displaced during high-impact injuries, particularly while skiing, cycling or playing rugby. Traditional repairs have addressed superior instability and providing arthroscopic techniques to stabilise the collar bone but this does not address the front to back instability which can now be readily addressed using the InternalBrace. Early mobilisation and accelerated recovery is now possible when shoulder ligament repairs or reconstructions are protected with an InternalBrace. For most patients it reduces pain and improves function minimising the disruption caused by surgery. It has transformed the patient experience. It is a small additional step but it dramatically improves the mechanical strength of the AC joint as well as comfort and function. This accelerates mobilisation and should assist with return to activity or play. Distal biceps rupture is often seen in power sports and can be a devastating injury. The avulsion often comes from bone and is close to the aero-vascular structures of the elbow and open exploration can result not only in nerve injury but risk of infection, and scarring resulting in elbow stiffness. The arthroscopic distal biceps repair is a technique which is minimally invasive and allows secure strong anatomical fixation of the biceps to radial tuberosity in a safe manner. This facilitates early mobilisation accelerated healing and return to sport. Shoulder stabilisation often has a six to eight month recovery period as the surgical repair is often thought to require a minimum of six weeks’ protection before the surgeon has the confidence to mobilise his patients fully and start the more extensive rehabilitation. It is, however, recognised that immobilisation is associated with pain, stiffness and weakness of the repaired tissues. 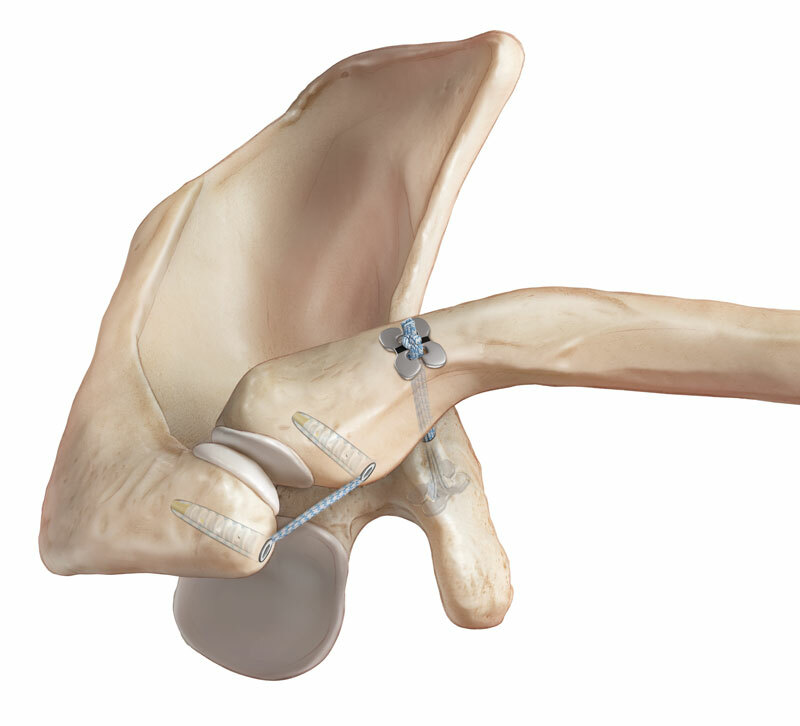 We have found that by using arthroscopic techniques with modern bio-materials immediate mobilisation within the first few days of surgery can be tolerated safely. Not only has this dramatically improved outcome and restoration of function, it has not resulted in any increased failures and in fact quite the contrary as it avoids post-operative complications of stiffness and more specifically capsulitis. We have found this to be highly successful not only in relative secondary patients but also high performance athletes returning to international level contact sports such as judo and rugby. After a simple dislocation and primary arthroscopic stabilisation, the non-sporting patient has restored excellent function and early return to work. SLAP repairs relate to a certain kind of shoulder instability where the biceps’ fixation point and the rim of the socket has peeled off. Surgeons in the past have had concerns about restoration of function after surgery as mobilisation after repair is often associated with pain and biceps irritation post-surgery. However, we found that this has been dramatically reduced by our early mobilisation programme which has also helped our patients after rotator cuff repair. The rate of mobilisation after cuff repair however, has to be tailored specifically to the patient, although in principal early mobilisation is still encouraged for all the reasons explained above.